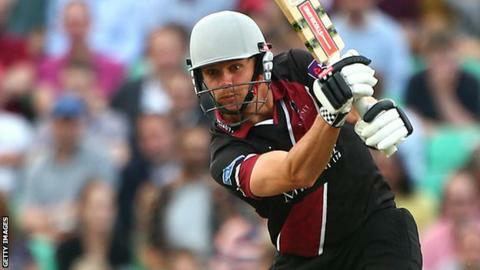 James Hildreth and Lewis Gregory both hit unbeaten centuries to lead Somerset to victory over Durham in their opening game of the One-Day Cup. Chasing 312 to win, the pair came together with Somerset on 106-5. But Hildreth hit 146 and Gregory a career-best 105 in a one-day county record sixth-wicket stand of 209 to ease home on 315-5 with 20 balls left. Former England batsman Paul Collingwood had earlier struck 113 as Durham recovered from 36-3 to post 311-7. The 38-year-old shared a century stand with Keaton Jennings (45) to get Durham back on track and brought up his century off 83 balls, with 10 fours and three sixes, before eventually being dismissed by a one-handed catch by former international team-mate Marcus Trescothick at extra cover. Somerset's reply got off to an equally poor start as Trescothick, Nick Compton and Peter Trego all fell inside the first six overs to leave them 21-3 as Graham Onions stuck twice. Colin Ingram helped Hildreth steady things with a stand of 82 for the fourth wicket, but after the South African left-hander was stumped off spinner Gareth Breese, Alex Barrow soon followed to leave Somerset up against it. However, Hildreth and Gregory had other ideas and counter-attacked by scoring in excess of eight runs an over to see their side home. Hildreth hit three sixes and 13 fours in his 134-ball innings, while Gregory reached his maiden century off 70 deliveries and hit a total of 13 fours and one six. "So much credit goes to Lewis Gregory because he played a fantastic innings and took a lot of the pressure off me. "It was a great partnership to be involved in and I enjoyed every minute." "The quality of cricket played by both teams was outstanding. When a lad comes in at number seven and hits a 70-ball hundred you have to take your hat off to him. "But we were in control of the game for long periods and that is something to take forward into our next match."